Just when we thought this dreary Brexit business could inflict no more harm on our language, we were presented with a new verbal atrocity. Suddenly, in and around the packed EU leaders' summit centre in Brussels, "flextension" was the buzzword of the latest long day's journey into night. That ugly word coinage, Brexit, used to be confined to a group of Euro nerds until this time three years ago, on the cusp of a certain UK referendum. Now, most of us just "Brexit" our way about like we draw oxygen. 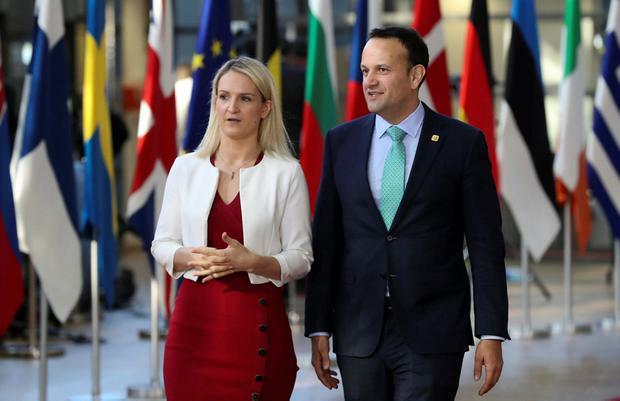 Please spare us the latest linguistic defilement, even if it comes from a man who has done Ireland a deal of good throughout this marathon stop-start-stop EU-UK divorce process. European Council President Donald Tusk threw out the term to mean the UK would best get a long extension to hopefully finally sort themselves out. But Mr Tusk continued that if Britain did manage to finally reach a good conclusion, one ratified by its most riven parliament, then by all means they could depart much earlier. The former Polish premier has clearly caught a bad case of the Brussels jargonitis - he had to fuse the two concepts. But curiously, as the 28 EU leaders gathered one more time in Brexit crisis mode, the big picture looked deceptively simple. There were three options: 1. Extend long. 2. Extend short. 3. Boot the UK out on deadline this Friday. Boot the UK out was always the least likely because it suits nobody, bar a small group of mendacious radical Brexiteers in London. Most member states, including the UK, would take a significant economic hit in a no-deal scenario. Ireland would take a worse hit than any of them. The EU would also risk taking the blame which rightly belongs in London. Rhetoric is dialled down when you consider the UK is the EU's second largest economy and the world's fifth largest. From shortly after the summit started, all signs were that the EU leaders were likely to extend. And there was a strong suggestion many would opt for a longer extension because they only wanted to do this one more final time. No clear date is cited but speculation focused on this coming December or March of next year, with that flexible provision the UK can quit earlier if they can finalise their exit deal. But not everyone - notably France - wanted to ease pressure on London too much, arguing that the only semblance of progress had come in recent weeks in the face of stark deadlines. So there were still big arguments for a shorter extension. UK Prime Minister Theresa May had sought to stay only until June 30. The question neatly fed into the proposal to attach strict conditions to any extension in order to ensure the UK does not, while waiting to leave, disrupt important upcoming EU work. This includes agreeing a new seven-year EU budget and appointing a new policy-guiding EU Commission. And that in turn fed into what some people call "Boris-proofing" any new arrangements with the UK. This is based on the real assumption that Mrs May's days in office are now well and truly numbered and she may well be replaced by a more strident Brexiteer - a certain blond-haired man called Johnson. Now, here were the really hard parts which took time to work out. Belgian premier Charles Michel was pretty strident. "You can't be half a member of the EU," he told reporters.